Der M53/M55 ist ein amerikanischer Selbstfahrlafette der Stufe 9. 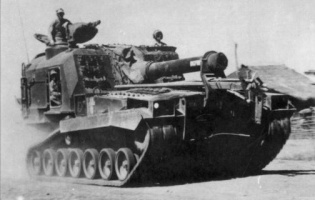 Eine Selbstfahrlafette auf dem abgeänderten Chassis des mittleren Panzers M47. Der Prototyp wurde 1952 gebaut, 1956 kam die Selbstfahrlafette in zwei Ausführungen zur Truppe: Die M55 für die Army, die M53 für die Marines. Der M53/M55 führt zum T92 HMC. Upgraded gun weighs less than the stock gun, meaning researching the suspension is not required to mount it. Nothing carries over from the M40/M43. The AN/PRC-25 radio carries over from the M44. 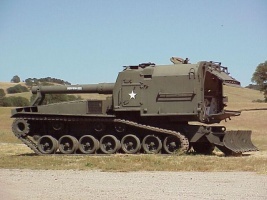 First, research the 8-inch Howitzer M47, as it is lighter than the stock gun. Finally, research the Continental AV-1790-7B Engine. 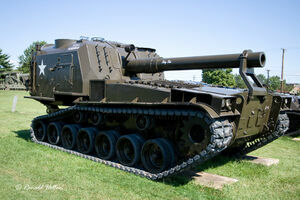 The M55 was an American fully enclosed and armored self-propelled artillery based on the M53 155 mm assault gun. It had a 203.2 mm howitzer which could traverse 30° left or right, carrying only 10 rounds of ammunition. The gun had a maximum range of 16,916 meters (10.51 miles) with a rate of fire of one round every two minutes. The M55 armor was light, 25 mm maximum, but sufficient to protect the crew from indirect artillery hits or small arms fire. 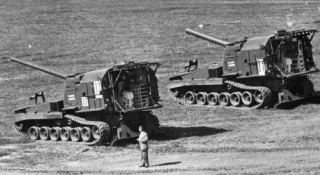 M53 & M55 self-propelled howitzers were quite unique vehicles. While borrowing the chassis, hull and automotive components of the M46/M47 Patton tanks, its internal arrangement was reversed to accommodate a rear-set fully-enclosed turret emplacement. The engine and transmission were now fitted to the front of the hull (as opposed to the rear) with the driver being relocated to the front-left of the turret (as in the M53). The track-and-wheel system involved seven double-tired road wheels per side along with the drive sprocket which was mounted at the front of the hull. One notable feature of the running gear was its lack of a track idler at the rear which gave the track link system of the M55 a very identifiable quality. Three track return rollers guided the upper track sections. The gunner crew operated under the protection of an enclosed armored structure which provided security against small arms fire or artillery spray as the steel armor protection was 25mm at its thickest. The complete crew numbered six and included the driver, vehicle commander, gunner and at least two loaders. The primary design characteristic of the M55 was its boxy turret emplacement, which was a turret in name only. Traverse was limited to 30-degrees to the left or right and little else, requiring the vehicle to be itself turned in the direction of fire more often than not. The 203mm M47 howitzer was of good strategic value, able to lob all manner of shells at the enemy position up to 17,000 meters. However, due to the large projectiles, the rate-of-fire was limited to just one round per two minutes and stowage aboard the vehicle meant that only 10 rounds could be carried - thusly limiting its tactical value (the M53 managed 20 x 155mm shells). Defense was through a Browning .50 caliber M2HB anti-aircraft/anti-infantry heavy machine gun mounted on a pintle at the commander's cupola. Power for the M55 vehicle was served through a Continental AV-1790-5B 12-cylinder gasoline-fueled engine outputting at 810 horsepower. This was mated to an Allison CD-850-4 transmission system that featured two forward and one reverse gears. The vehicle, therefore, could manage up to 30 miles per hour on ideal surfaces and featured an operational range out to 160 miles. 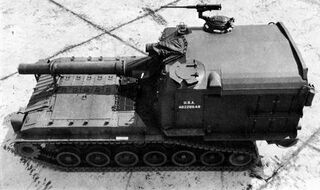 As improvements were brought into the Patton tank lines, the M53 and M53 vehicles adopted some of these measures including the AV-1790-7B engines and CD-850-4B transmissions. Similarly, the original stick steering control arrangement later gave way to a conventional steering wheel design. Some M55s were utilized operational during the American involvement in the Vietnam War (1955-1975) though they were eventually removed from inventory within time. The M53 and M55 shared some commonality of parts themselves, able to utilized the same ammunition racks and M86 gun mounts which made for some logistical friendliness. Beyond its use in the United States military, the Belgian Army became the only other notable operator of the M55 vehicle. 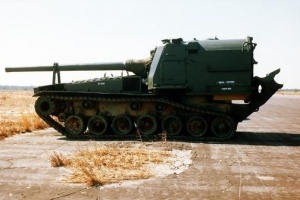 The last M55 was retired from active service (with the Belgian Army) in the 1970s. Diese Seite wurde zuletzt am 25. Oktober 2016 um 13:31 Uhr geändert.